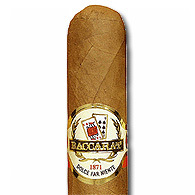 Made from all Honduran grown tobaccos and rolled in a sweetened wrapper, Baccarat Cigars feature an inviting aroma to compliment its mild and creamy taste since 1872. Despite being very affordable, they pack a premium taste and are very consistent in their quality and construction. These cigars are actually rolled at the Camacho Cigar factory, so you know they are going to be well constructed and high quality. Try either the Baccarat Maduro or Baccarat Natural, or any "Baccarat The Game" Cigars and discover this mellow and creamy hidden gem.